If you have a long, thin garden, you may well find it a bit of a nuisance. The end of the garden is a long way from the house, making it difficult to mow the lawn, run power to, or, if the sun sets at that end of the garden, transport food and beverages from your house to a seating area in the sun. But a long, thin garden can also be a blessing in disguise, especially when landscaped professionally. 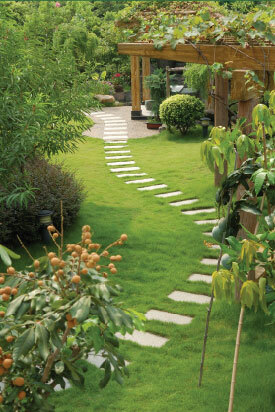 With a little forward planning, your narrow garden can really work for you. A rule in any garden, but especially important in a thin garden, is to make sure that all of your hard landscaping is cohesive. By this we mean only using two different materials within your garden, plus wood (which is exempt from this rule, as it’s such a natural material and therefore works with many other textures and tones). Choose stone, glass and wood which is all of the same tone and blends into the landscape. This will stop one material from dominating the garden. The key to making a long, skinny garden look pretty is to add balance and lines. For example, add a flower border to just one side of the garden, and follow this with a path immediately adjacent to it. Lay the other half of the garden to lawn, so as to balance the flower bed and add depth. One of the benefits of a long garden is that you’ll have the space to create different zones within it. Make sure that you have plenty of seating areas at various points in the garden, such as a patio immediately upon exiting the house, a bench halfway down and decking at the end of the garden. Seek out the area that gets the most sun, and make this a dedicated seating or dining area. If there’s a space at the end of the garden which is used less, as it’s the furthest point away from the house, use this to house the likes of sheds, greenhouses and vegetable patches, then shield it from view with trellis and climbing plants. Then think about other zones you might want or need, such as a dedicated children’s play area within view of your house. Using low level fencing or walls can create different zones, and add container planting for colour and height. If you have a long and narrow garden which is in need of some inspiration, speak to D&G Garden World. We enjoy working with gardens of all shapes and sizes in Orsett, Upminster, Brentwood and Hornchurch, and can use our professional expertise and experience to work with your garden’s best assets.